Tina Martel is a Canadian artist whose practice includes mixed media, painting, drawing, books, photography, installation and video. Born and raised in Saskatchewan, she began drawing at the age of four, and later, (much later) received a Master of Fine Arts from the University of Calgary and a Bachelor of Fine Arts from the Alberta College of Art and Design. 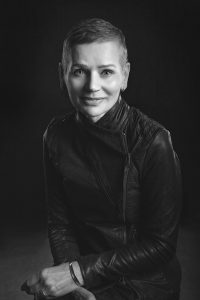 She has been the recipient of numerous grants and awards and has exhibited across Canada, the United States and in Europe. She has been teaching fine arts in the post secondary system for the last 15 years. All she really ever wanted out of life was to create and never have to wear pantyhose. Ryan, Janice: Artists Take Vehicles from Verdant to Vroom, Edmonton Journal, Edmonton, Alberta. July 2, 2010. Online Video The Works: Evolve edmontonjournal.com, Edmonton, Alberta. June 27, 2010. Stefansson, Wendy: Tina Martel: tenuous Art of the Peace – Cover Article, Grande Prairie, Alberta. Fall/Winter 2008. Rinne, Diana: Martel Creates Tenuous Truck, INK! Magazine, Grande Prairie, Alberta. July 14, 2008. Kienlen, Alexis: Grande Prairie Artists Receive New ACDI Funding, The Daily Herald Tribune, Encore Magazine, Grande Prairie, Alberta. May 1, 2008. Dronyk, Dymphny: On being an artist & other survival strategies… Art of the Peace, Grande Prairie, Alberta. Fall/Winter 2003. Rinne, Diana: Touching the Surface, The Daily Herald Tribune, Encore Magazine Grande Prairie, Alberta. May 3, 2002. Author Unknown: Fur Auto-Fans und Philatelisten Dorsten Waz Dorsten, Germany. August 2, 2000. Westra, Monique: Fresh Technique: Meet Three of Calgary’s Emerging Artists Where Magazine, Calgary Gallery Guide. Calgary, Alberta. Summer 2000.
tenuous: The Creative Process in Public Execution Lobstick 7, Grande Prairie Regional College Grande Prairie, Alberta. Jan. 2010, Pg 133-138.